After leaving the South Rim, we traveled southeast to Cameron, where we made a brief fueling stop at the Cameron Trading Post. We would be making a much longer stop there – both to eat and to shop – in a couple of days on our way back to Phoenix. As we had left our hotel earlier in the morning we were all dismayed to find that one of our group had a medical emergency. He and his wife were evacuated overnight to the regional medical center in Flagstaff for surgery. Road Scholar provides for such emergencies, however, and this one had a happy outcome. Nevertheless they were sorry to have missed the North Rim. This is a picture of the (top of the) gorge of the Little Colorado River, which joins the Colorado in the depths of the Grand Canyon. The gorge is very deep and narrow and is cut into a level plateau. As our guide Bruce said, anywhere else this gorge would be a major tourist attraction in its own right. Here – naaah. Again the question: where did this river find the energy to cut such a gorge? No one knows. 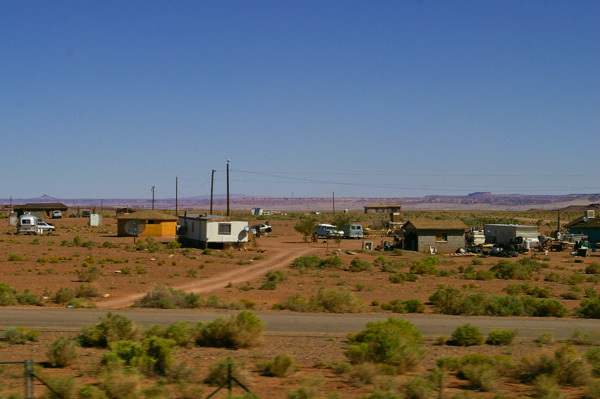 Much of the day's travel was through the Navajo reservation. We passed many scattered family compounds such as this one consisting of a mix of traditional hogans, single-wide trailers, travel trailers and stick-built houses with a variety of vehicles scattered around. We saw some sheep and cows, but most of the livestock we saw were horses. The elevation here is much lower than the canyon rim – and much hotter. The vegetation shows that we are back in the desert. After our stop at Cameron, we turned north toward the Navajo Bridge crossing of the Colorado. 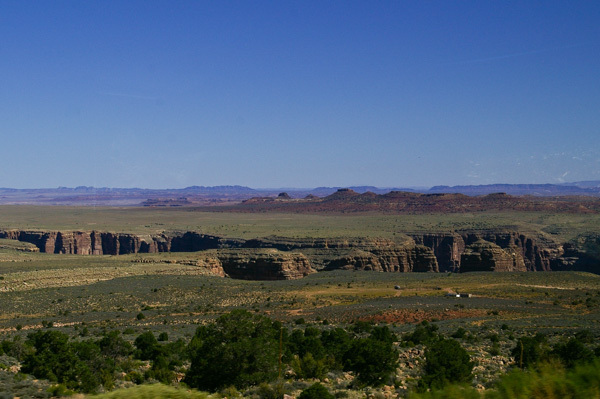 For most of that time we drove along the Echo Cliffs, which are just as colorful and somewhat more rugged than the more famous Vermillion Cliffs. 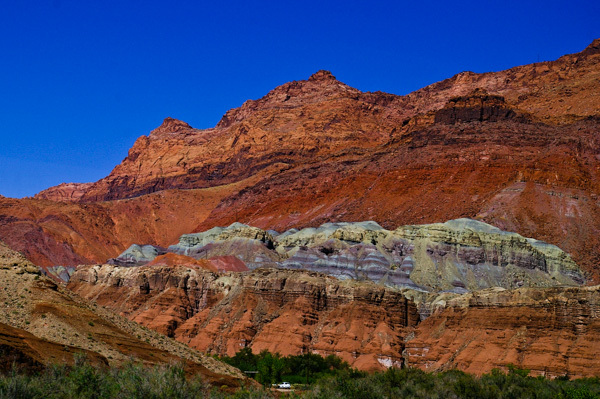 This picture shows the colorful chinle formations that give the Painted Desert its name. The Navajo use the varicolored sands from this formation as well as other materials for their sand paintings. We stopped for lunch at the Marble Canyon Lodge. I wandered out afterwards to take a picture of these cliffs. 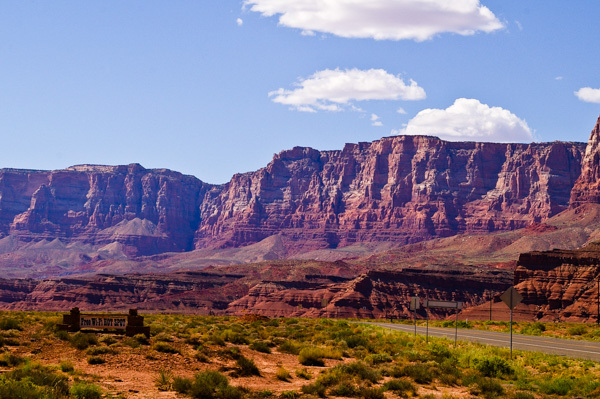 No clue why Marble Canyon is so named. There is no marble to be seen in the area. On the other hand it's clear where Vermillion Cliffs got their name! I thought the "free wi-fi" sign was a nice touch. 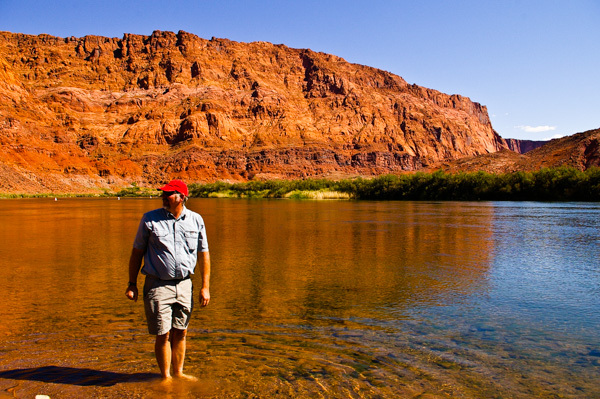 Our guide Bruce is wading in the Colorado at Lee's Ferry, the official beginning of the Grand Canyon and the place where Grand Canyon raft trips begin. We are standing at a large boat ramp. 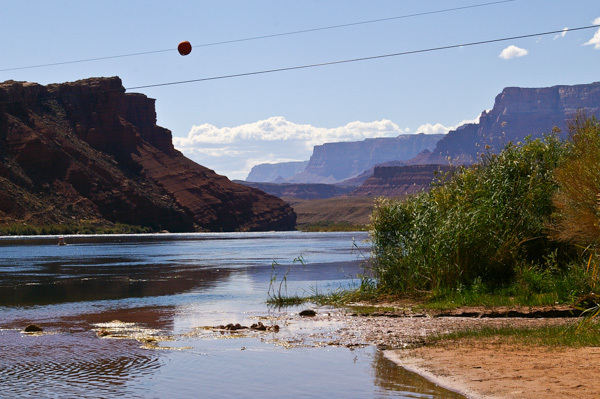 Looking downstream toward Marble Canyon. On the far bank of the river you can see traces of the old "dugway" that provided access to the ferry. Nowadays it just looks like rock strata. The wires across the river lead to a USGS gaging station. While we were at Lee's Ferry, there were two river trips putting in. During the high season, this area is a madhouse with many different groups launching their expeditions. The group pictured here is using both dories and rafts. It is a commercial outfit. 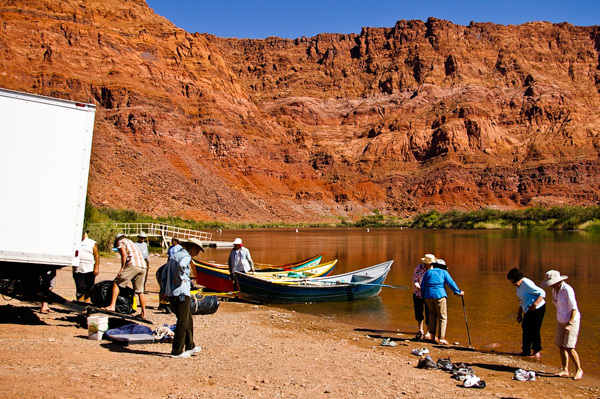 Oh – the folks on the right wading in the water are part of our group. This outfit, on the other hand, was a private group. They may have waited several years to get a permit. Bruce explained the confusing procedure used to get a permit. I won't attempt to describe it here. 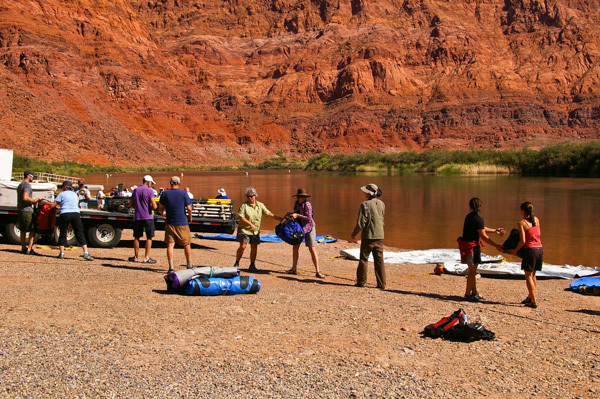 Check the "river trips" link above for a summary. The folks from the private trip getting ready for their launch. Everyone was eager to be working together – although not everyone knew exactly what needed doing. I expect by the end of their trip they would function as a well-oiled machine! Since neither of these groups were using motorized equipment, the trips could take up to three weeks. That's a lotta nights in a sandy sleeping bag! 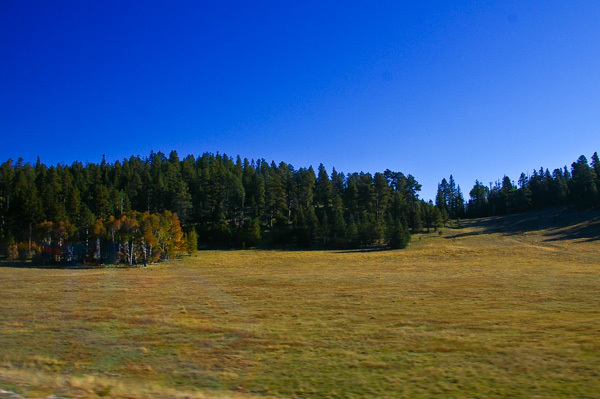 The rising ground to the left and the location where I took this picture are part of the Kaibab Plateau. The Grand Canyon is carved through this plateau. The mystery is when, how and why the river's path went through this area, which is higher than its surroundings. These questions are pretty gnarly. 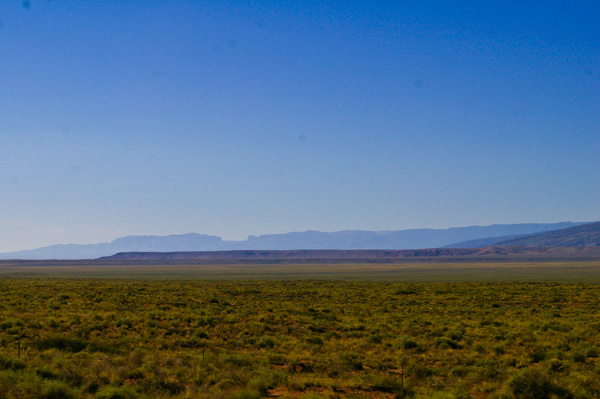 The red rise on the right is the end of the Vermillion Cliffs. 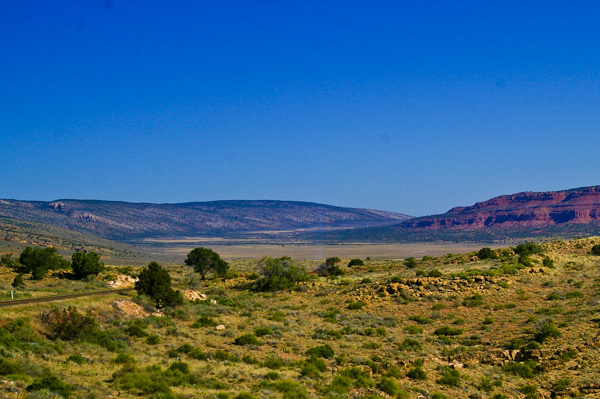 Bruce told us that the same formation continued on the opposite side of the Kaibab uplift. Another oddity. The view south from the same location. The notch in the escarpment is called "The Saddle." We will see it from its other side on our visit to Point Imperial. One theory of how the river carved through this uplift is that the uplift occurred after the river had already established its path. Not everyone agrees that the river is that old, however. After we climbed onto the plateau and entered the lush Ponderosa Pine Forest, we came to an area that had been completely burned. Everyone is familiar with Smokey the Bear. With the best intentions forest management has been geared toward suppression of all fires. Unfortunately the forest is adapted to frequent fires that clean out the undergrowth. The result has been an overstocked woodland that is subject to catastrophic fires. 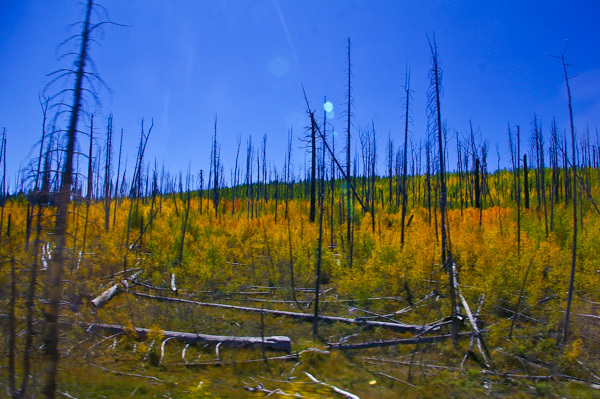 Aspens, turning their fall color, are the first to recover. As we gained altitude we came to a succession of natural alpine meadows. Periodically we saw mule deer and small ponds. The ponds were fenced because there has been concern about the impact of bison and hybrid beefalo or cattalo that were introduced into the area in the early 20th century. After a short time we arrived at the North Rim of the Grand Canyon. It was even more spectacular than the South Rim!